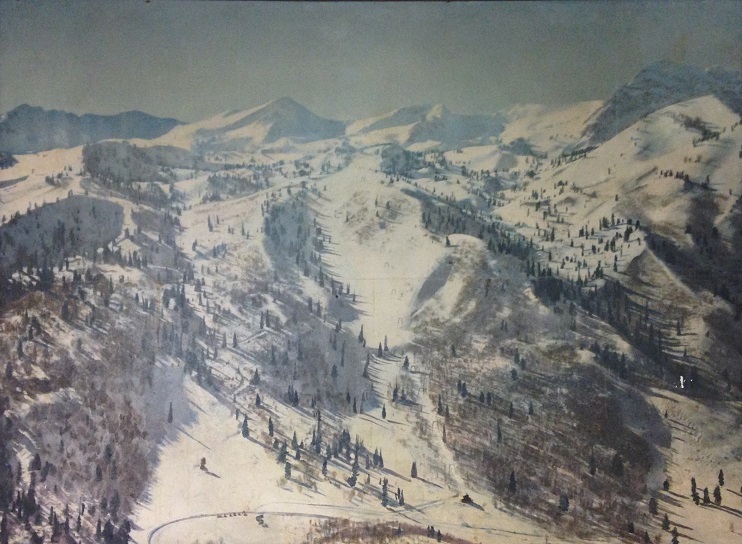 Above: Photograph of Snow Basin that is hanging in the Club House at El Monte Golf Course. Mid 1940's. You can't operate a ski area without a ski patrol and Snow Basin created one of the finest. This is the first of several installments about the Snow Basin Ski Patrol. When you join the ski patrol, you become part of a brother/sisterhood that tends to stay together for years, and even decades. 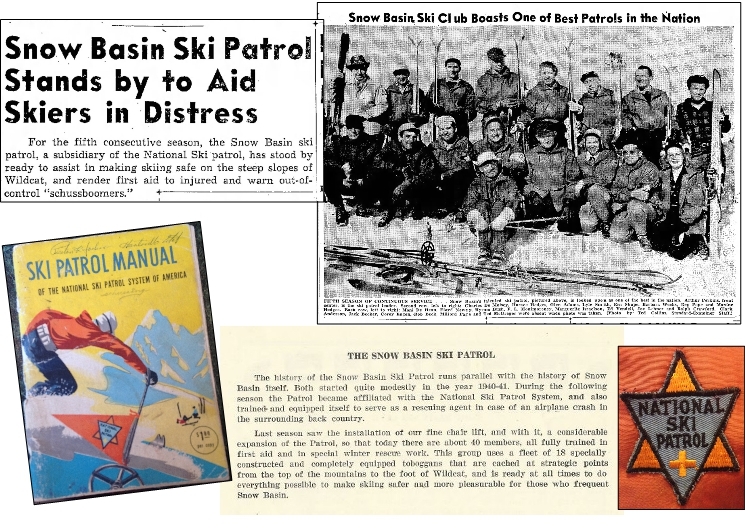 Both former and current members of the Snow Basin Ski Patrol have been very helpful in my quest for old photographs, information, contacts and great war stories. On opening day of the 2015-16 season I happened to strike up a conversation with a local skier while waiting for the opening bell. The skier turned out to be Tommy Lee, a ski patroller from the 1970's. Tommy and I ended up talking for a good hour and we even took a few runs together. Tommy educated me on a few patrol terms, pointed out one or two historical locations, and gave me a couple names of former ski patrol to contact for more info. 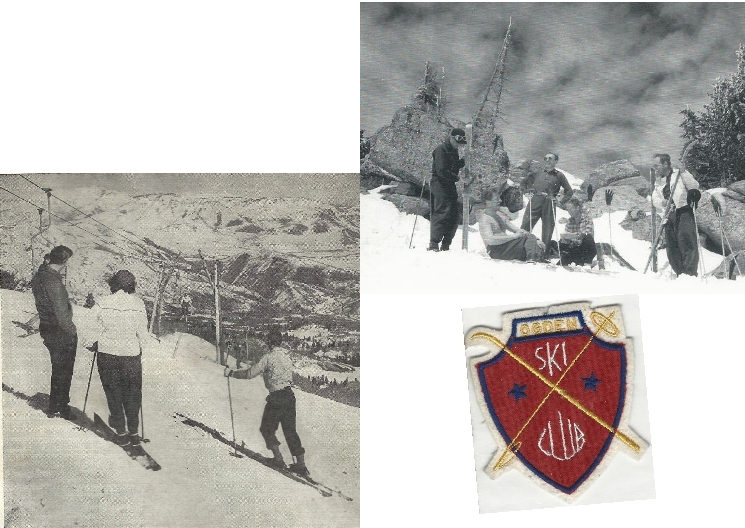 Above: 1946 Ski Patrol. Source: Ralph Johnston Collection from the Weber State University Archives. 1940's Ski Patrol history. Researched and recorded by Ralph Johnston. Above: 1949 Ski Patrol. Source: Ralph Johnston Collection from the Weber State University Archives. National Ski Patrol Manuel. Source: Don Wilson. National Ski Patrol Patch Source: Nick Breeze. Ogden Standard-Examiner newspaper articles. Source: Newspapers.com. Boyd Crawford was born and raised in Ogden, Utah and started skiing with his brother, Ralph, in 1943. 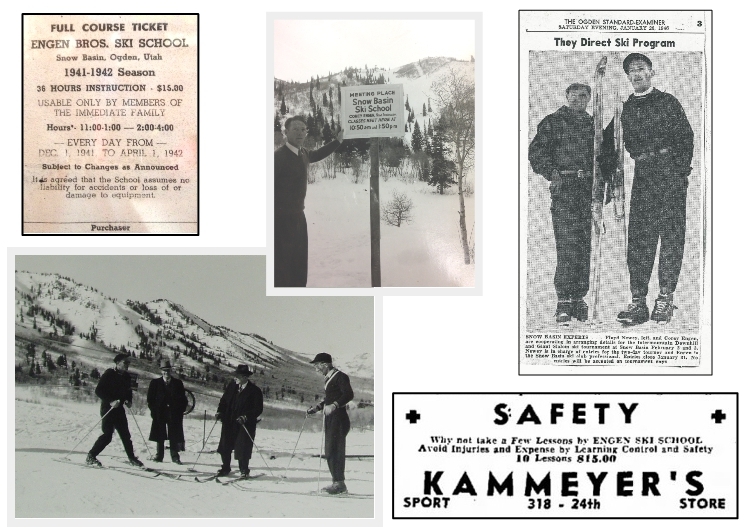 In the late 40's Boyd and Ralph joined the Snow Basin Ski Patrol. Boyd served on the Snow Basin Ski Patrol for several decades. 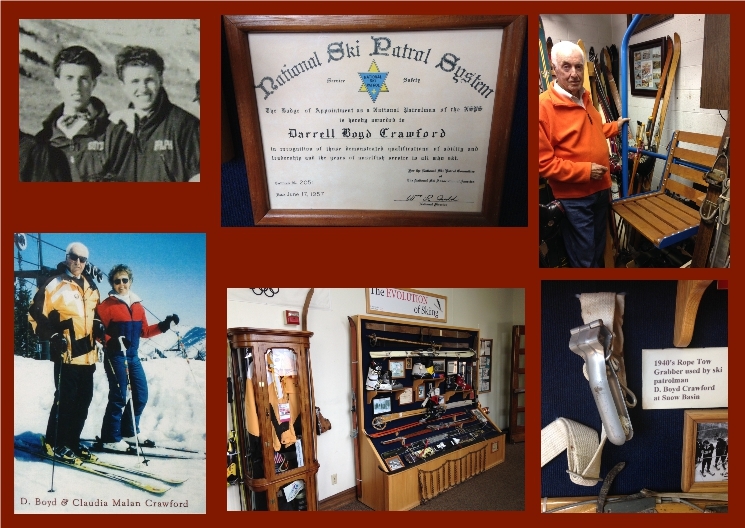 He has been a member of the National Ski Patrol for over 50 years. While serving in the U.S. Army between 1953-1955, Boyd became assistant ski patrol leader of the Garmisch Ski Patrol in Garmisch, Germany. I visited Boyd at his home a few months ago. When he introduced himself, he said that he is addicted to skiing. I knew right then and there that I was in the right place. While visiting Boyd he told me a story of how Ted McGregor, a city employee and tow operator, would drive up 24th street on his way to Snow Basin, he would drive a city owned flatbed truck and pick up kids along the way, they would sit on planks in the back of the truck. Boyd said “it was cold ride up”. Upon arriving to Snow Basin the boys would help Ted with his setup by digging the rope tow out of snow drifts then they would ski for the rest of the day. After Bert Jensen's stint as the Ski School director, Corey Engen, the youngest of the Engen Brother's was hired. As well as being a good ski instructor and racer, he was well known and respected in the ski industry. Having Corey on staff helped Snow Basin gain recognition. Corey ran the Ski School and concessions until the mid 1950's when he moved to McCall, Idaho. Top middle: Corey Engen. Bottom Left: Corey and Alf Engen teaching Ogden City officials. Source: Ralph Johnston Collection from the Weber State University Archives. Top Left: Ski instruction ticket. Source: Nick Breeze. Top right: Floyd Newey and Corey Engen. Source: Newspapers.com. 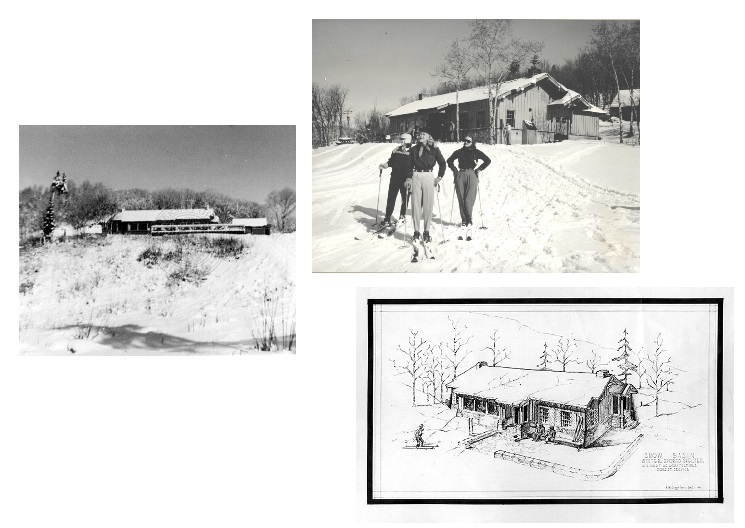 Snow Basin's first permanent lodge was constructed by CCC (Civilian Conservation Corps) labor in the summer of 1941 but wasn't completely finished due to lack of Forest Service funds. Because of this the Ogden Ski Club stepped in and helped finish the lodge, including construction of the rock fireplace. It was finally completed in 1943. The lodge was owned by the National Forest Service and was officially referred to as: Forest Service Shelter. Because it was a shelter, it had to be open 24 hours a day in the event someone was in need. Floyd and Twilla Newey were the first to run the concessions. Alan Miller's family ran the concessions in the 1950's and Alan remembers that they had to have someone at the shelter 24 hours a day during the ski season to prevent theft and vandalism. Forest Service Shelter. Source: University of Utah Ski Archives and the Ralph Johnston Collection. Before I end this decade I want to give a shout out to a few of the ski enthusiast's that helped make Snow Basin a success in the 1940's: Glenn Adams, Clark Anderson, Bob Becker, Gus Becker, Boyd Crawford, Ralph Crawford, Barbara DeHaan, George DeHann, Monie DeHaan, Alf Engen, Corey Engen, Sverre Engen, Margaret Israelson, Bob Kiesel, F.C. Kozell, Ted McGregor, M. Earl Miller, F. L. Montmorency, Floyd Newey, Ray Nye, Dr. Arthur Perkins, Wes Robbins, Edward Saunders, Ernie Schneiter, Louise “Tex” Shirley, Ora Smith, Roy Stoker, Harold Strand, Howard Tribe, Ed Vendell, Jack Whittaker, and the entire Ogden Ski Club who's names are not listed. Above: Ski Club Officers. Source: Ralph Johnston Collection from the Weber State University Archives. Roll up your Levi's and get ready for the 1950's!